The high-speed railway line from Xiamen to Shenzhen, which will open on December 28, will suffer huge losses because of its lower-than-expected ticket prices, a source from a high-speed railway corporation was quoted by media as saying Wednesday. 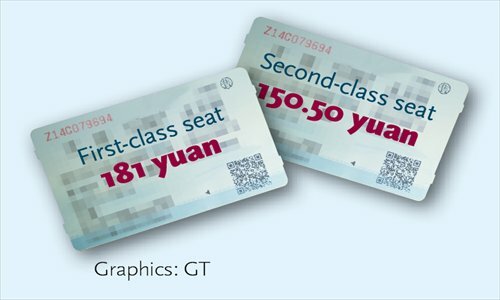 The sales price for a first-class seat on the line is fixed at 181 yuan ($29.81) and a second-class seat sells for 150.5 yuan, according to the pricing system of the Xiamen-Shenzhen high-speed railway line. The whole line is 502 kilometers. Xiamen is located in East China's Fujian Province, and Shenzhen is a city in South China's Guangdong Province. "The Xiamen-Shenzhen high-speed rail line will likely suffer an annual loss of 2 billion yuan based on the newly announced ticket prices," the source was quoted by 21st Century Business Herald newspaper as saying. The total income for the Xiamen-Shenzhen railway line is predicted to be only around 600 million yuan in the first year during its initial operation period, which is still not enough for the railway corporation to pay back the banking loan interest, according to the source. "The corporation will very likely face tightened cash flow," the source said. The total investment for the construction of the Xiamen-Shenzhen line was around 50 billion yuan, with 70 percent of the money coming from bank loans. It was estimated that it would take 17 years for the railway line to recover its total cost, according to its initial design plan. "But it seems that the target will likely not be achieved," the source said. Before the opening of the Xiamen-Shenzhen high-speed railway line, there was no direct train running between the two cities. Passengers could transfer at Guangzhou station, with the cheapest ticket price at least 182 yuan. The cheapest one-way airline ticket between the two cities is around 700 yuan. While concerned about the issue of losses for the high-speed railway, analysts were split on the line's prospects for profitability. "Making profits on the high-speed railway is just a matter of time," Wang Mengshu, deputy chief engineer of the China Railway Tunnel Group, told the Global Times Wednesday. According to the original design plan for the Beijing-Shanghai high-speed railway line, it will take around 12 to 15 years to recover all of its cost of 250 billion yuan, but actually the railway line could recover its total cost within 10 years due to its large passenger flow, said Wang, who is also a railway academician at the Chinese Academy of Engineering. The Chinese government has undertaken efforts this year to reform its pricing mechanism for the nationwide railway system. The State Council, the country's cabinet, released guidelines in August this year about reforming its financing for the railway construction and pricing system. 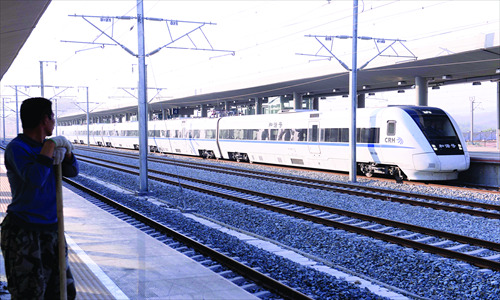 The Beijing-based Economic Information Daily newspaper cited sources last week that China will release the reform plan for the pricing system of railway transportation at the beginning of next year. The ticket prices for high-speed rail will possibly be allowed to float in accordance with passenger flows, the report said. Currently, the ticket prices for both high-speed railways and ordinary passenger railways are fixed at a certain level with no fluctuation, meaning prices are the same during rush hours and off-peak hours as well as throughout the year, which makes it less attractive for private investors mulling going into railway investment. "A floating pricing system, which means prices during off-peak hours will be reduced, but prices will remain unchanged during rush hours, could avoid a waste of railway resources and reduce losses for the railway corporation," Wang noted. But Zhao Jian, a professor at Beijing Jiaotong University, had a different view, saying that it is "almost impossible for the high-speed railway lines to reverse their situation of suffering losses due to huge costs, especially in China's central and western regions, where the passenger flow is very small." "Finally, gaining fiscal support from the central government will be the only way for the railway corporation to repay their debts," Zhao told the Global Times. China Railway Corporation (CRC), the body that was spun-off from the now defunct Ministry of Railways, reported a total debt of 3.06 trillion yuan by the end of the third quarter, with its debt ratio hitting 63.22 percent. Its net losses reached 1.7 billion yuan in the same period.